A mix of retro and modern is in. So when it comes to making a little update to your everyday plates and cups, we like the idea of mixing in old and new — even a mix at the same table setting, like taking clear glassware and adding pops of color like from vintage-looking green glassware sets. 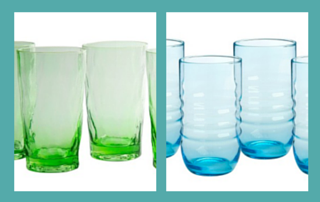 We’ve found some affordable blue and green glassware for you, with several sets kid friendly (aka won’t break when it falls to the floor). Stephen Cardino, VP and Fashion Director for Home at Macy’s says “Blue is a hot hue this year and there are many ways to apply the color of the sea to your summer tablescape. For a subtle look, try soft blue dinnerware layered with neutral table linens and flatware. To achieve a bolder statement, choose plates and serveware in indigo or with patterns of dots and stripes. 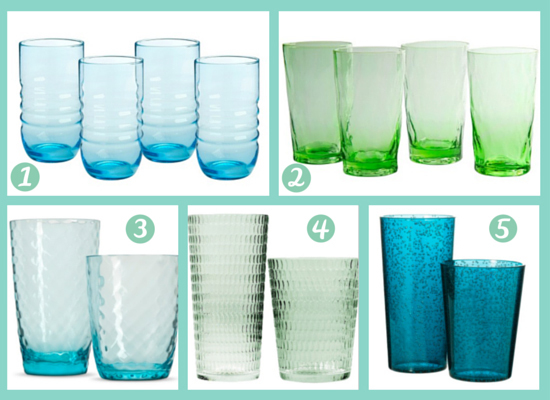 Glassware in a variety of blues and greens can also enhance your table.” The 1950’s had a lot of blue and green in its glassware, with patterns and swirls. Artland Spa Highball Glass Set of 4 – Aqua (20 oz) — $29.99 — lead-free glassware has a beautiful hand-crafted design with the aqua color. Threshold™ Azura Tumbler Set of 8 – Blue — $39.99 — shatter-proof plastic cups are great for tailgating or camping and a must-have in homes with pets or small children. And best of all, with their eye-catching criss-cross pattern, no one will ever know these plastic cocktail glasses aren’t the real thing. EV Summer Set of 8 Tumbler Glasses with Dots Texture – Turquoise (15 oz) — $15.99 — this is made of plastic but looks like glassware. So it won’t break as easily. Great value for a set of 8 with a textured dot pattern. Room Essentials Bubble Tumbler Set of 8 – Blue — $13.99 — Made of transparent plastic, these drinking glasses have tiny bubbles for visual texture. 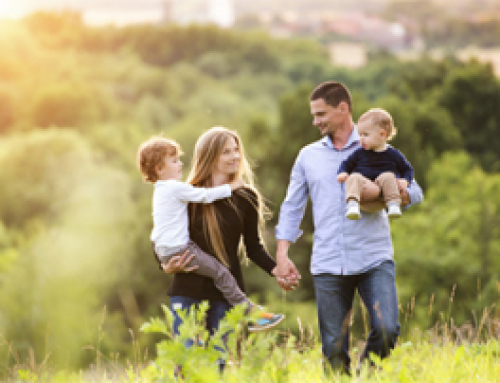 Fun and kid-friendly. Here’s some simple seasonal punch recipes for your new tumblers. What are your favorite retro table settings?